Why do people do what they do? Because of what happens to them when they do it. Richard S. Gold, president and chief operating officer of M&T Bank, recently shared this concept and deeper insights on behavior science as part of the Leaders on Leadership Speaker Series, hosted by the University at Buffalo School of Management’s Center for Leadership and Organizational Effectiveness. Antecedent: The trigger or prompt that causes people to act. Behavior: The action taken. What someone does or says. Consequence: What happens to the person during and after the behavior, which keeps an action going or causes it to stop. As for consequences, there are four possibilities: positive reinforcement, negative reinforcement, punishment and penalty. Positive and negative reinforcement increase a behavior, while punishment and penalty cause behavior to decrease or end. When a manager uses negative reinforcement, employees end up on the “have to do” track, where they expend the minimum effort needed to fulfill their duties and avoid the “or else” part of their manager’s ultimatum. 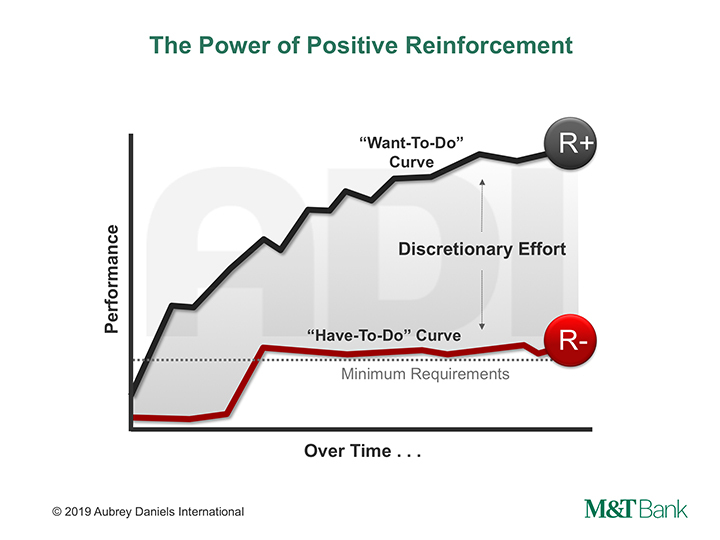 Positive reinforcement, however, is the key to unlocking discretionary effort and getting your employees on a “want to do” track, where they go above and beyond — even when you’re not looking. Communicate a compelling vision to create a powerful antecedent for your employees. If you can paint the picture that people can get behind, you begin the process of evoking followership. Understand what is reinforcing to the people you oversee. It’s different for everyone, so it’s critical to take the time to understand what’s uniquely reinforcing to each person in your charge. Positively reinforce the needed behavior. Since behavior flows to the most reinforcing part of the environment, you need to set yourself up as the primary source of reinforcement. Maintain your credibility. One of the most important ways to maintain credibility is to always do what you say you are going to do. You also have to demonstrate commitment to and responsibility for the leaders around you and their behaviors. Once you lose your credibility, it will be difficult — or even impossible — to get it back. Richard S. Gold is president and chief operating officer of M&T and its principal banking subsidiary, M&T Bank. He was named to this position, and to the board of directors of both M&T and M&T Bank, in December 2017. 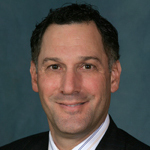 Gold began his career with M&T Bank in 1989 as an executive associate and has served in a number of management positions in retail banking and business banking, mortgage and consumer lending and marketing. In 2014, he was named vice chairman and took on the role of chief risk officer. Gold earned a bachelor’s degree from Cornell University School of Industrial and Labor Relations and an MBA from New York University Stern School of Business. He is an adjunct professor in the University at Buffalo School of Management. This entry was posted in Leadership and tagged behavior, leadership, motivation, reinforcement by UB School of Management. Bookmark the permalink. I was an employee of M&T Bank for 39 years. Rich introduced Aubrey Daniels to the Bank along with the ABC concept. I recall during the initial rollout of the training & the Bib Blitz drills was somewhat unfavorable. Having been through a number of trading sessions along with multiple years of completing the drills, it had a positive impact on my leadership style as well as my personal life. I still revert to the ABC’s in my day to life & various volunteer opportunities that I’m involved in since my retirement in April 2017. Thanks Rich!